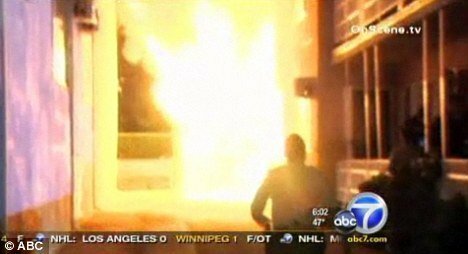 An arsonist struck across Hollywood on Friday early in the morning, torching vehicles and setting homes ablaze in 19 separate fires over a four-hour period. Firemen in Los Angeles, California, were scrambling to put out the fires that lit up parked cars and then spread to nearby homes and flats. Dozens of Hollywood residents were forced out of their homes and power was disrupted in several neighborhoods shortly after midnight. “It was a long, tough night,” a Los Angeles County fire spokesman said, adding that the department does not yet have any suspect description. One of the blazes happened at the former home of late Doors lead singer Jim Morrison, who died in Paris in 1971 aged just 27. Jim Morrison used to live in the house with girlfriend Pamela Courson in the 1960’s and it provided the inspiration for the Doors song “Love Street”. There were no civilian injuries, but one city fireman was treated and released from a hospital after a fall while battling a blaze. “I woke up really scared,” evacuated resident Daniel Meza told KABC. Daniel Meza had to run and get his little sister as well as wake up his parents and tell them all to get out of his block of flats. Arson investigators are looking for building CCTV and eyewitnesses. “If you see something, say something,” the L.A. County fire spokesman said. It was the second day of arson fires in Hollywood. Two people were arrested on Thursday following a spate of similar car and rubbish fires. But those men remained in custody on Friday, so it is not yet clear who was behind the latest fires in Hollywood and West Hollywood. Samuel Arrington, 22, of Sunland, L.A., was arrested along with another person on Thursday when a shop worker allegedly saw him trying to cause damage. “We have so many that are going around hitting occupancies just like this, carports with residents above,” an L.A. City fire spokesman told KABC. Hollywood is served by the L.A. city police and fire departments. But the fire and sheriff’s departments of L.A. County serve West Hollywood.